August 9, 1995 – Jerry Garcia was the frontman/guitarist for the most famous psychedelic jamband in the history of Rock and Roll: the Grateful Dead. In 1947 a wood chopping accident with his older brother at the Garcia family cabin causes Jerry to lose much of the middle finger on his right hand at the age of five. That winter, Jerry’s father drowns while on a fishing trip. In 1950 Jerry and his brother move in with their maternal grandparents for a five-year stint. Jerry attends Monroe Elementary School, and is greatly encouraged in his artistic abilities by his third grade teacher. Through her, he discovers that being a creative person is a viable possibility in life. It is during this time that Jerry picks up the five-string banjo. His brother introduces him to early R&R around 1953 and four years later on his birthday he receives an accordion. Not his instrument he complains, until it is exchanged for an electric guitar with amp. His step dad introduces him to open tuning style and Jerry starts his musical journey. He dropped out of school at age 17 and served nine months in the U.S. Army before being discharged for poor conduct. He began to play folk and blues guitar—alone or with pickup groups—in clubs within the San Francisco area while working as a salesman and music teacher in a music store. After the stint in the army, he meets Bob Hunter and together they performed what became his first paid gigs at the Commedia Theater in Palo Alto. After surviving a major car accident in February of that year his focus turns completely to music over his hobby of drawing and painting. Completion of the Grateful Dead Roots nears when Jerry jams with Bob Weir on the last day of 1962, when one of Jerry’s students doesn’t show up for lessons. 1963 is a year for early family bliss as Jerry and Sara Ruppenthal form Jerry & Sara and marry later that same year. 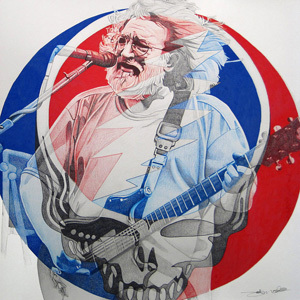 Jerry joins the Zodiacs formed by Bill Kreutzmann, featuring Pigpen on harmonica, Garcia on bass, and Troy Weidenheimer on guitar. In the fall Jerry forms The Black Mountain Boys with friends David Nelson and Eric Thompson and on December 8 Sarah gives birth to daughter Heather. The future still looks open and normal. But then in the spring of 1964 Jerry, Ron “Pigpen” McKernan, and Bob Weir join forces as Mother McCree’s Uptown Jug Champions. Other members include Dave Parker, Tom Stone, and Dave Garbett. They play throughout the summer. The following spring Phil Lesh and Bill Kreutzmann join Jerry, Pigpen, and Bob to perform their first gig as The Warlocks at Magoo’s Pizza in Menlo Park, CA and in December of that year, The Warlocks change their name to Grateful Dead on discovering another group with that name, and perform their first of many shows as the house band at a Ken Kesey Acid Test in San Jose, CA. And then enters 1966 and Jerry and the rest of the bands move into a communal house at 710 Ashbury Street in San Francisco’s Haight-Ashbury section. The house becomes fixture and center point for much of what is now known as the Summer of Love, Flower Power, Psychedelic Rock, Acid Rock – the house became the local music venue for free concerts for the 18 months or so they live there. The Grateful Dead performed more free concerts than any other band in history. Closely involved with the San Francisco hippie movement and the use of drugs such as LSD, the band first played “psychedelic” rock but moved on to a more diverse repertory of rock styles in the 1970s. From around 1974 the band’s members began to go their own ways, and Garcia made solo appearances and albums. In the 1980s he became heavily addicted to drugs, and after being arrested in 1985 was sent to a treatment center. After emerging from a diabetic coma, he decided to turn his life around, and the band made a comeback (1987) with a hit single, “Touch of Gray” and an album, In the Dark. Garcia and the rest of the band enjoyed this new wave of success and continued to tour, drawing legions of fans—new and old—to their shows. The Grateful Dead had built quite a following over the years and their loyal fans, soften called “Deadheads,” were known to travel around the country following to catch their concerts. Unfortunately, the show could not go on forever. Despite Garcia’s efforts to improve his lifestyle, all of the years of hard living caught up with him. He died of heart failure on August 9, 1995, in Forest Knolls, California. In 2003, Rolling Stone Magazine ranked him 13th in their list of the 100 Greatest Guitarists of All Time. Jerry performed with The Grateful Dead for their entire three-decade career, which spanned from 1965 to 1995. He also founded and participated in a variety of side projects, including the Jerry Garcia Band, the Garcia/Grisman acoustic duo, Old and in the Way and Legion of Mary. Jerry also co-founded the New Riders of the Purple Sage with John Dawson and David Nelson. He released several solo albums, and contributed to a number of albums by other artists over the years as a session musician. Jerry was inducted into the Rock and Roll Hall of Fame as a member of the Grateful Dead in 1994.